Doctors are encouraging middle-aged Aussie blokes to have their prostate checked. Their call coincides with a newly published MJA Insight article, citing benign prostatic hyperplasia (BPH) – or a benign enlargement of the prostate – can compromise a man’s quality of life and his relationships with his partner and family. According to article author, Clinical Associate Professor of Urology at Macquarie University, Bill Lynch, Sydney, the prostate – a walnut-sized gland in the male reproductive system that surrounds the top of the urethra and is found under the bladder – has proven extremely burdensome to the lives of men. An enlarged prostate can cause difficulty in passing urine and over time can lead to the complete inability to pass urine, urinary infections, damage to the kidneys or bladder and eventually potential surgery – reportedly the major concern for men regarding their prostate. “Prostate issues are a fact of life for men and are just as relevant now as they have been through the ages. “BPH is a progressive, non-cancerous disease that tends to strike ageing men. Fifty per cent of men aged in their 50s will experience BPH, increasing to 80 per cent of men aged in their 80s,” said A/Prof Lynch. “While not all men with BPH will show symptoms, more than 30 per cent of those aged over 50 will experience moderate-to-severe lower urinary tract symptoms (LUTS), two-thirds of whose symptoms will be caused by BPH. “This equates to more than a million Australian men experiencing significant symptoms due to BPH, noting most men aged over 50 must contend with LUTS,” A/Prof Lynch said. The quality of life for men with symptoms of BPH is significantly lower than for those exhibiting no symptoms, with daily activities, such as driving, sport, sleep and social activities considerably affected.5 Moreover, BPH is also linked to male sexual function, with a higher International Prostate Symptom Score (IPPS) – a scoring system used to screen for, diagnose and monitor symptoms – associated with more severe erectile dysfunction. “Men experience varying symptoms of BPH with different degrees of bother, including increased frequency and urgency of urination both day and night, difficulty starting, maintaining and finishing urination. They may also experience urine infections or urinary retention,” said urological surgeon, Dr Martin Elmes, Gold Coast. Business Development Manager, weekend skateboarder and father-to-three adult children, David, 61, Gold Coast, has first-hand experience of BPH, having lived with the disease for almost five years before being diagnosed and treated last year. “I was constantly going to the bathroom. I had to plan my entire day around the next toilet, and I was getting up about four-to-five times a night to urinate. Further testing confirmed David’s frequent urination was in fact due to BPH, and he was referred to urological surgeon, Dr Elmes, for treatment. In his article, A/Prof Lynch argues it’s important to get to ‘the heart of the matter’, citing the management of prostate symptoms can have far-reaching benefits for a man’s general body health. 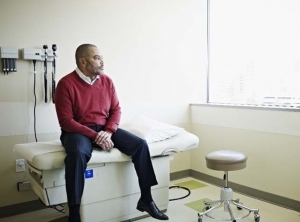 “Maintaining overall prostate health is vital. Importantly, anything that’s heart-healthy, is prostate healthy. “Nearly all documented interventions or lifestyle changes beneficial for heart health, have been shown to prevent, or reduce the impact of BPH and LUTS, including moderate exercise, diet (regular vegetable and water consumption, fibre and Omega-3 intake), and weight control,” said A/Prof Lynch. “Making lifestyle and behavioural changes to positively support prostate health should prove even more beneficial to the heart while helping to allay men’s fears over surgery,” A/Prof Lynch said. Importantly, having BPH does not increase your chance of developing prostate cancer. BPH worsens over time if not treated.1 Various tests are available to determine whether symptoms are indicative of BPH or another condition. If you suspect that you or a loved one may have symptoms of BPH, talk to your GP and check the severity of your symptoms online at www.disappearingdave.com.au to learn more.